Strong antioxidant power and protective effect on the vascular system. Broad spectrum application (skin, cognitive function, inflammation…). 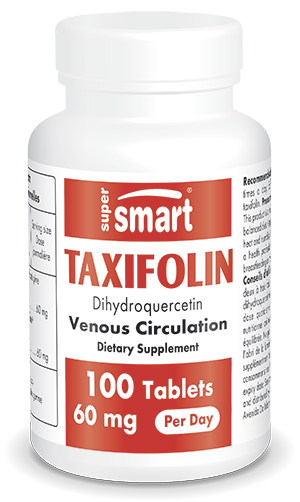 Taxifolin or dihydroquercetin is a bioflavonoid with a similar structure to that of quercetin. It is extracted from Siberian larch. - improves memory in 70% of patients suffering from cerebral circulation problems. In 60%, it increased concentration and index of intellectual activity. Each tablet provides 10 mg taxifolin. Take one to two tablets two or three times a day for three to four weeks. Repeat every three months. The tablets be taken with, or immediately after, a meal. They can be swallowed, chewed or sucked.